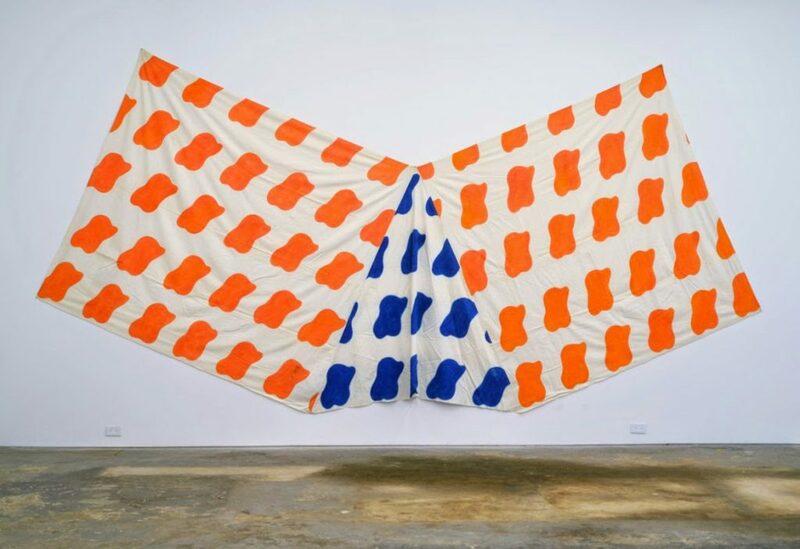 In 2011, seeing a relationship to the casualist tendency in contemporary art, I posted about Claude Viallat’s work and the inventive art movement known as “Supports/Surfaces” that took hold in the mid-1960s in the south of France. Expanding the notion of painting, Supports/Surfaces artists stressed the experimental use of non-art materials and valued process over image. This summer, in conjunction with France’s Bernard Ceysson Gallery, CANADA is presenting “Supports/Surfaces,” a welcome group survey of this under-recognized but highly influential movement. Jean-Pierre Pincemin, Carrés Collés, 1973, acrylic on canvas, 106 x 94 inches. Numerous contemporary painters like Noam Rappaport, Lauren Luloff, and Gedi Sibony share an aesthetic sensibility with the Supports/Surfaces movement in that they embrace supports and materials as well as the canvas itself as part of the art they make. Unlike those painters, however, the S/S artists of the sixties and seventies took an explicit left-wing political stance and were considered radicals. Freud, Marx, Mao, Greenberg, and Fried were all on their reading lists. French society in the 1960’s was undergoing upheavals and social protests that mirrored the struggle for civil rights and anti-war movements in the USA. Many of the artists involved with Supports/Surfaces were veterans of the war in Algeria, and as young artists and citizens they were looking for alternatives to the colonial war machines that seemed to be the norm in western society. They made art without slick fabrication, organized on loose permeable grid structures; which implied a canvas and utilized repeating forms and/or patterning which seemed to offer a humane possibility for both art making, and a metaphorical proposal for just society. 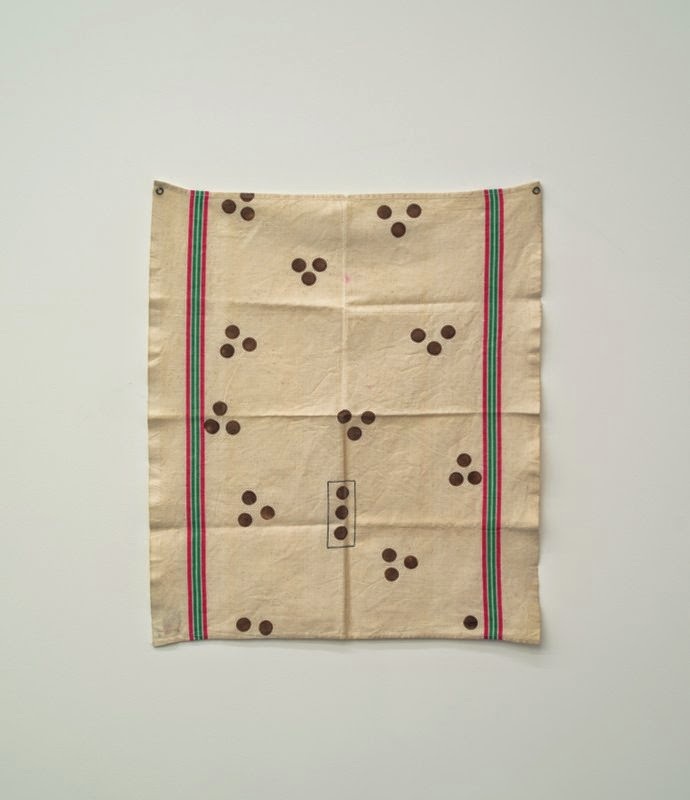 Noel Dolla, Torchon a pois, 1971, acrylic on cloth. 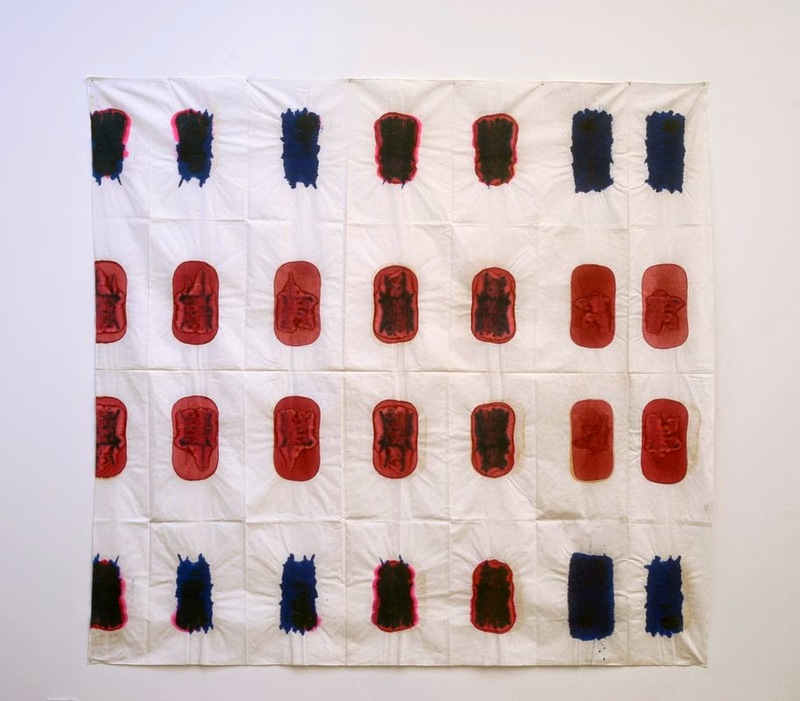 Claude Viallat, 1970/F007, 1970, dyed rope 54 x 7 inches. Witness the dishrags of Dolla, the painted sunshade umbrellas of Viallat, the lathe constructions of Dezeuze or Saytour’s bolt of raw fabric in the seminal piece Deployed. 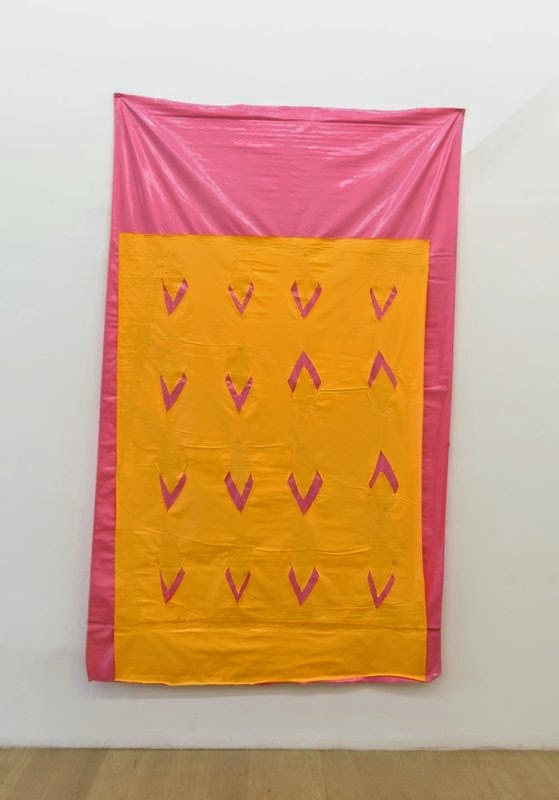 Supports/Surfaces artists may or may not have been the first to pick up such materials, but what they did with them formally is the key to what sets the group apart from say Arte Povera in Italy or the more famous French group BMPT. 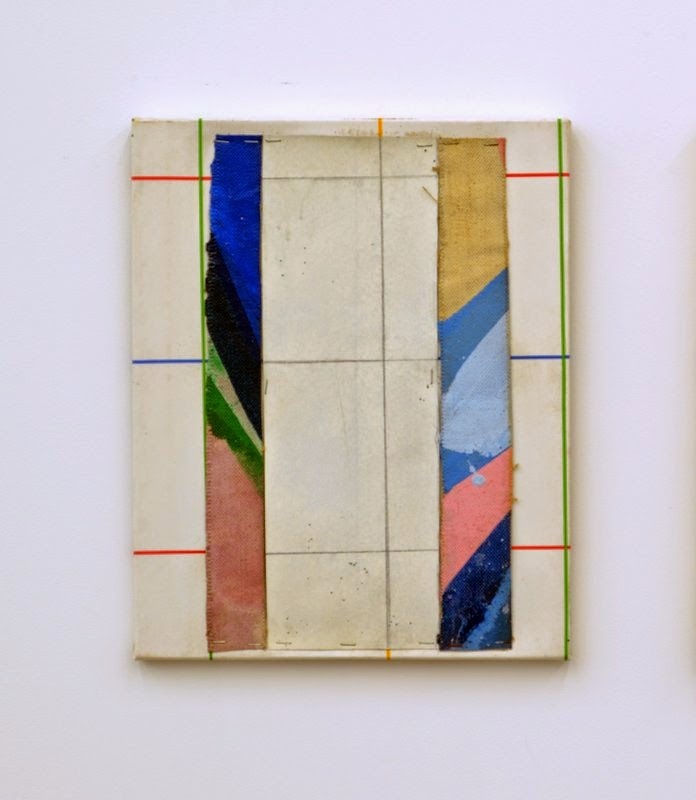 In their hands there was a coupling of base material, the format of painting and the poetics of unprogrammatic form and color that simultaneously questioned and reaffirmed painting. Jean-Michel Meurice, Vinyle, 1976, yellow and pink vinyl collage, 98 x 59 inches. Last Sunday, in a short gallery-sponsored discussion moderated by Rachel Stella and including longtime S/S proponent Raphael Rubinstein, Bernard Ceysson, Paul Rodgers, and two of the artists, Noel Dolla and Pierre Buraglioin, the panelists discussed the artists, the movement, and the continued importance of S/S concepts. Many in attendance (standing room only) marveled at the freshness of the work; the consensus was that much of it could have been made today in, say, Bushwick. As noted above, there is an undeniable aesthetic connection between S/S art made more than forty years ago and work being produced today. But the current approach, radical forty years ago, is no longer experimental, especially iconoclastic, or self-consciously polemical. Rather, it has become an established painterly language that subsumes the ideas and values pioneered by the S/S artists. That’s a kind of progress. André-Pierre Arnal, Pliage, 1971, spray paint on canvas, 79 x 40 inches. Yet, in this era of supposed pluralism in which “anything goes,” this approach, which I have called “casualism,” still prompts acrimonious debate within the painting community. Sometimes disparagingly called “crapstraction,” the prominence that casualist work has gained in art schools and MFA programs has caused palpitations among older painters who despair that exalted painting traditions–technical proficiency, “rigor,” and the craft of building and priming canvases, for instance–will perish. Pierre Buraglio, Untitled, 1983, mixed media 16 x 13 inches. Patrick Saytour, Pliage, 1973, mixed media on canvas, 91 x 98 inches. The resonant exhibition at CANADA is important not just because it shines a light on the subliminal influence the S/S movement has had on our contemporary aesthetic, but also because it reinforces the notion that abstract painting can be rooted in politics. As faux-smart abstraction becomes increasingly popular among collectors and speculators, this timely show shrewdly exhorts young artists to understand the historical and political significance of their decisions in the studio, their materials, and their techniques. 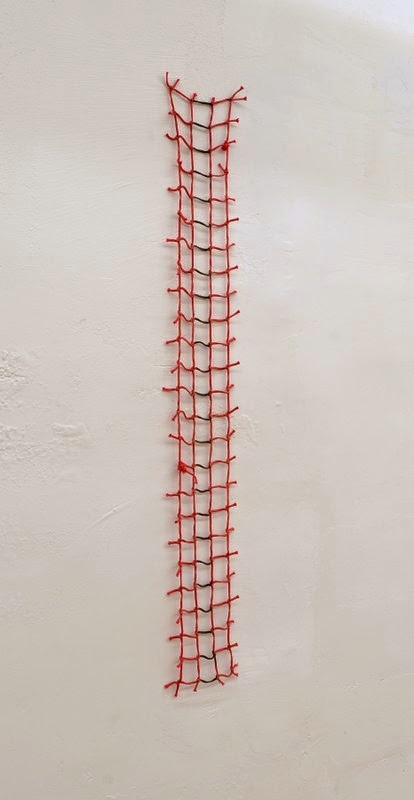 “Supports/Surfaces,” featuring work by André-Pierre Arnal, Pierre Buraglio, Louis Cane, Mark Devade, Daniel Dezeuze, Noël Dolla, Jean-Michel Meurice, Bernard Pagés, Jean-Pierre Pincemin, Patrick Saytour, Claude Viallat. Presented with Galerie Bernard Ceysson. CANADA, Lower East Side, New York, NY. Though July 20, 2014.
essay compilation Polychrome Profusion: Selected Art Criticism:1990 – 2002, which was published on ArtCritical in 2004. I’m looking forward to reading a forthcoming anthology, edited by Rubinstein, of S/S essays originally written in French. Excellent post about a very intelligent group exhibition that starkly asks, yet again, whether highly-wrought art is really superior to "provisional" or "casualist" work and what the criteria are. The answers now are no less subjective, complex, or controversial than they ever were, but that's exactly why shows like this one ought to keep posing the question: it gets the blood flowing and energizes the dialogue about art. 40 years after they had been invented.